We’re dreaming of a white Christmas for Iron Craft this challenge, which meant we were asked to create something using the color white. 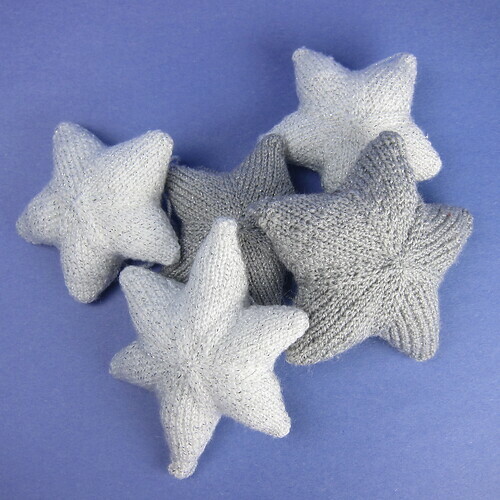 I decided to knit up some white (and silver) stars which will become part of a larger project later on. These look a little tricky to put together, taking multiple points and joining them together in the round, but if you follow the step by step directions and photos below it’s a cinch. This is one of those patterns that after you knit it once you almost don’t need to look at the pattern again. After I did a couple, I started messing around a bit with the size and shape. You can make these bigger or smaller by changing the needle size and yarn. On these the small one is done on a size 0 needles and the large one is done on size 3 needles. You can change the shape of the star but adding a sixth point or making some of the points longer. I did both for this elongated star. Do a 6-point star with all short points for Hanukkah decorations. A string of them in white and light blue would be beautiful. Gauge: Gauge is not important in this project just make sure you are getting a tight weave so the stuffing doesn’t show through. Cut yarn and put point on a stitch holder or leave on needle. Make 4 points and put them on one needle. Now make a fifth point, but this time do not cut the yarn. Place a stitch holder after that point. You are now going to join all the points together and then knit them in the round. This is really the only tricky part of this pattern, hopefully the pictures below will help too. With the yarn that is still attached to the last point you made, knit 10 stitches from the first of the four points you have on the other needle. Now onto a new needle, knit the remaing 5 stitches from that first point, the 15 stitches of the second point and then 5 stitches from the third point. 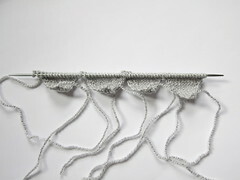 With another new needle, knit the 10 remaining stitches from the third point and the 15 from the fourth point. 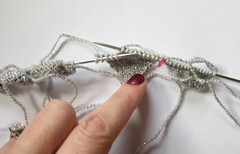 Join into a round by knitting 1 stitch from the point before the stitch marker. Make sure none of the stitches are twisted. Cut the yarn, leaving at least a 6″ tail. 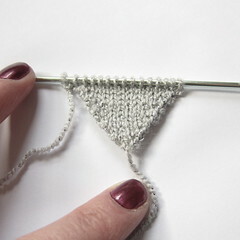 Put the tail on a tapestry needle and weave through the stitches on the needles. Remove the needle and pull the stitches tight closing the hole in the middle. Pull tail through to the back and knot or weave in. Weave in all ends. (I actually only weaved the ends in that were between the points. The ones at the tips I just left inside the star when I sewed it together.) You can leave the tail on one of the points to use as a hanging loop. Make a second star. Sew the stars together, wrong sides facing each other. When you have the side of one point left to sew, stuff the star. Then sew shut. Make 2 long points and 4 short points. You will put this star together just like five-pointed star except you will have 6 points. When you are putting the points together to knit in the round put them in this order, 1 short point, 1 long point, 2 short points, 1 long point, 1 short point. 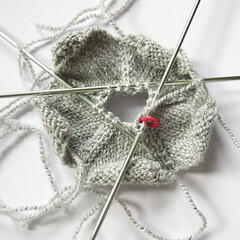 Put two points on each needle as you are putting them together to knit in the round. The decreases are the same as the 5-point star except you will start with 90 stitches and end with 18. This pattern is for personal use only. Do not duplicate it for distribution, sell it, teach it or sell items made with it without permission. 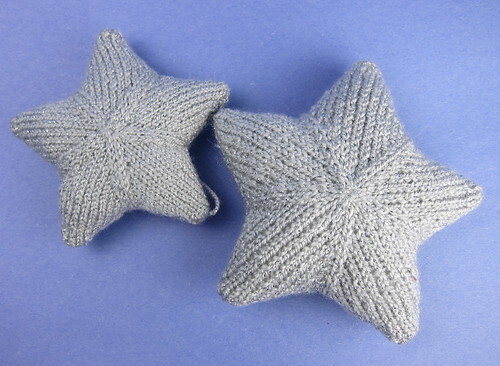 As always, if you make some stars with our pattern we’d love to see them in our Flickr group. Later I’ll show you how I use these stars…. 6 years ago by Kat in Christmas , Holiday , Knitting , Knitting Projects , Needlecraft , Projects | You can follow any responses to this entry through the RSS feed. You can leave a response, or trackback from your own site. Those came out so cute. I think I may have to add that to my list….for next year. 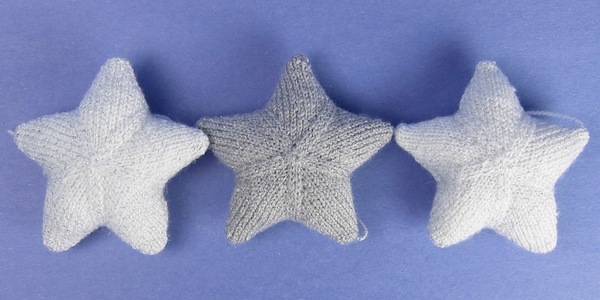 I started making some stars but got distracted by another project – the story of my life lately. Yours turned out really cute! Great pattern & tutorial; thanks for sharing! Luciana – It is too small a circle to knit on circular needles, unless you know how to do magic circle (which I don’t). Give four needles a try, it isn’t as hard as it looks! Knitting with four needles isn’t too hard. If you want to do it with circular needles, I suggest that you use the magic loop method. It is personally my favourite. 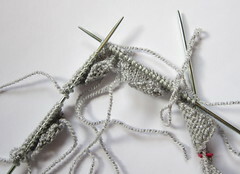 You could use two circular needles (of the same size, of course) to do this. I’ve done that many times. Yes, of course you could or even magic loop. That just doesn’t happen to be the way I like to knit in the round. This is so beautiful! I am pinning this pattern! 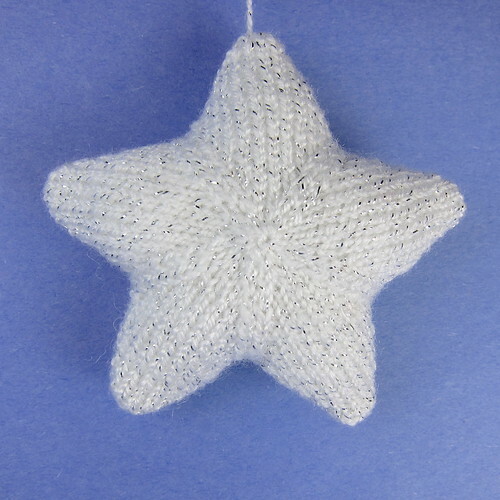 I’ve been looking for a stuffed star pattern, and this one looks perfect, but… how big are the stars? 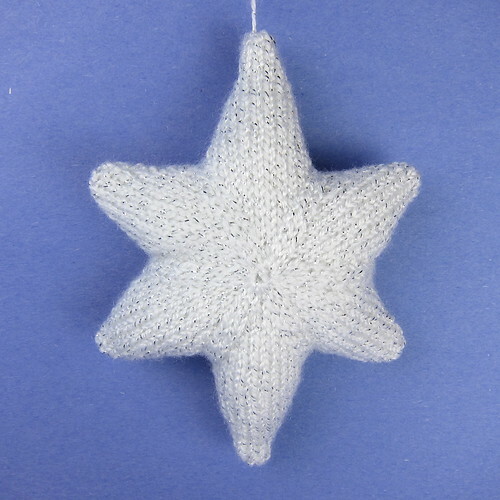 I’m looking to make a star topper for my mum’s tabletop Christmas tree, and need to make sure this star will fit! It’ll really depends of the weight yarn you use. Mine were about 3 – 3 1/2″ inches across. 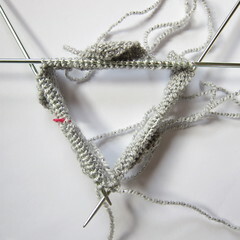 I have done all my little triangles, but I am stuck on the joining them together. Are you meant to follow the instructions beside the pictures? Or follow them but use the stitches written below (Row 1: (ssk, k11, k2tog) repeat until end of round (65 stitches) Row 2: k etc.) Or do you follow the instructions “Now onto a new needle, knit the remaing 5 stitches from that first point, the 15 stitches of the second point and then 5 stitches from the third point…” etc. and then go onto the Row 1: (ssk, k11, k2tog). I am quite confused! Follow the instruction by the pictures which are for assembling the star and then do the part that starts with Row 1: ssk, k11, k2tog) and so on.. The part with the pictures helps you get the stitches onto three needles and joined into the round. 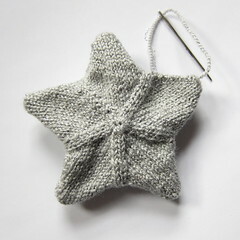 The next part knits the middle of the star. Hope that helps! Est il possible d’obtenir l’explication des étoiles en français? Je suis désolé , mon français est pas assez bon pour traduire le motif. Perhaps you could try running it through something like Google translate?